The Caprese Hot Dog was a delicious Burger Night discovery. Our family has had “Burger Night” every Saturday night (that we were all in town) for at least 10 years. After trying a few alternative locavore dishes (like Pasta Night), it just feels better to stay with burger night and try to make it a bit more local. I usually have a hamburger on burger night, as I haven’t been wild about hot dogs since I went to a weight-loss hypnotist many years ago. (The only effective part of the hypnotism was a mild aversion to hot dogs. Go figure.) So, what a pleasant surprise to taste the wonderful Caprese Hot Dog assembled by my creative dinner companions. 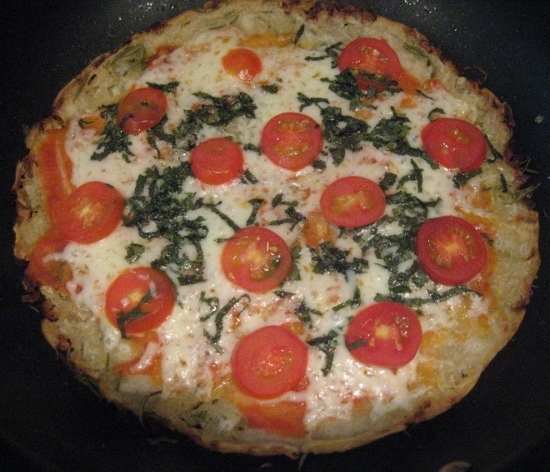 It was so yummy that we had them again Sunday night with the focaccia and cheese. 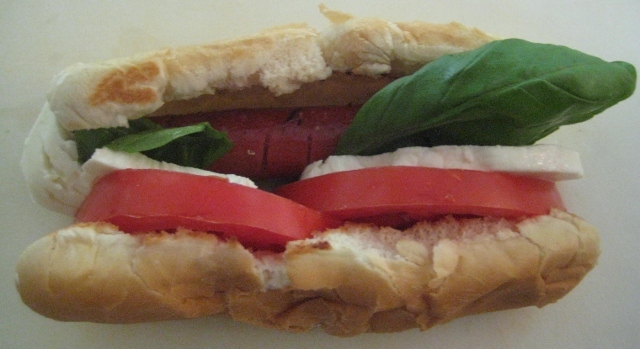 My hot dog, shown above, had basil, tomato, and mozzarella as condiments. Patrick added a bit of olive oil to his. I highly recommend this tasty combination!